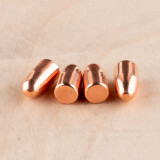 Berry's copper plated bullets are a great choice for affordable yet reliable custom loads. 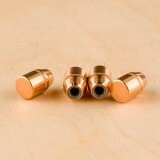 Each projectile in this box of 1000 is a 158 copper plated Round Nose (RN) with a .375" diameter. 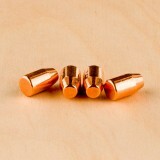 These bullets are swaged and plated to their final weight, then each bullet is re-struck to ensure consistency. 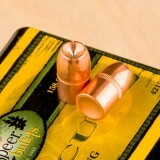 Copper plated projectiles have less barrel fouling compared to traditional cast lead bullets and are more affordable than jacketed projectiles. 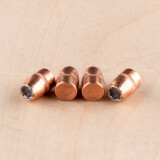 Note: Plated Bullets are not recommended for velocities over 1200 feet per second. 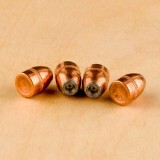 Berry's Bullets have earned a reputation for quality and consistency. 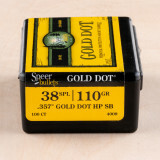 These 158 grain 38/357 projectiles are a great choice for affordable loads that are higher quality than traditional lead round nose projectiles. 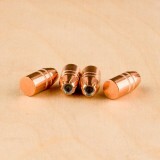 Each of these bullets are swaged at room temperature and copper-plated to their final weight. 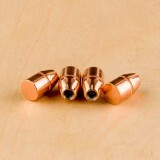 After plating these bullets are re-struck to ensure each projectile has a uniform plating and is symmetrical. 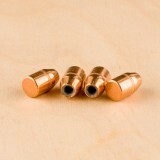 Note: Plated Bullets are not recommended for velocities over 1,200 feet per second. 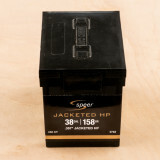 Be sure to check out Widener's extensive collection of powder, primers and cases, for all of your re-loading needs. 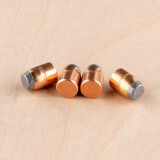 These .357 inch diameter projectiles from Zero Bullets have an exposed soft lead tip at the crown of their copper jacket for a balance between expansion and penetration that makes them great for self-defense loads or even light game hunting. 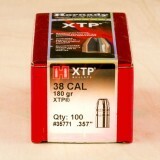 These bullets weigh 125 grains and are great for versatile use with both .38 Special and .357 Magnum calibers. 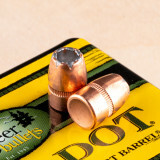 In addition, Zero Bullets manufactures these Alabama-made bullets with a toothed cannelure on the jacket for proper crimping which prevents the jostling of the projectile from its casing while in the cylinder. 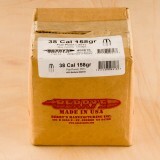 Don't forget to check out Widener's great selection of pistol powders, while you're here. 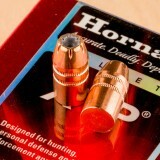 Hornady has earned a reputation in the shooting industry for providing reliable, high quality products. 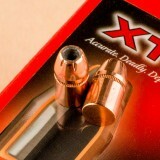 Their eXtreme Terminal Performance (XTP) projectiles are engineered for hunting and self-defense applications. 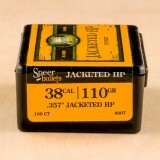 Each bullet in this box of 100 measures .357" in diameter and weighs 158 grains. 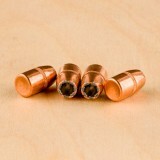 Expansion is controlled by a tapered copper jacket that has precise serrations cut around the rim. 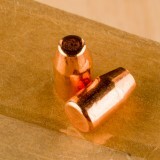 The lead core has a uniform density to promote balanced expansion and in-flight stability. 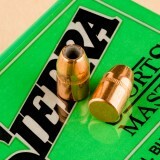 If you need massive stopping power and proven reliability, these are the bullets for you. 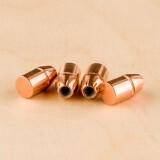 These .357-diameter bullets are made for .38 Special cartridges, delivering effective internal, external, and terminal performance. 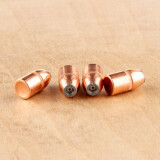 The jacketed hollow point SportsMaster bullets are designed for high velocities and rapid expansion. You’ll get 100 bullets that have Sierra’s unique cavity for quick expansion. 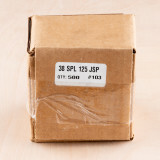 Anyone who shoots in high volumes understands the importance of quality, consistency, and affordability. 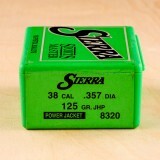 That’s why so many gun owners reload their empty cases with bullets from Sierra. 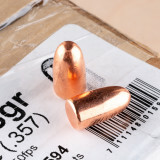 If you own a handgun that takes .38 Special rounds, you can reload your empty shells with 125-grain bullets that are extremely effective in rounds that will be used for varmints, medium-sized game, and everything in between. 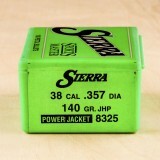 Founded in California in 1949, Sierra is a company based on quality, precision, and consistency. They are now based out of Missouri but continue the tradition of providing reliable products to ammo reloaders all over the country. With bullets for many different handguns and rifles, Sierra is a trusted choice for thousands of gun owners. 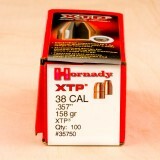 Hornady's eXtreme Terminal Performance (XTP) line of bullets are designed for hunting, self-defense and law enforcement applications. 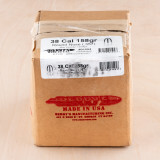 Each projectile in this box of 100 measures .357" in diameter and weighs 180 grains. 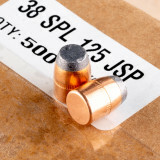 These are Jacketed Hollow Point (JHP) bullets that have precise serrations notched in the top of the jacket to promote controlled expansion upon impact, even at low velocities. 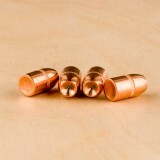 These projectiles have a uniform lead core that is balanced and promotes in-flight stability. 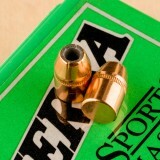 Absolutely amazing bullets. I can consistently hit chickens at 200 yds. with a 10" contender with Belm .357 Max chamber and IMR 4227! 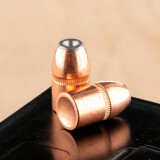 The only bullet with a 2nd crimp groove for the .357 Max! Good hog and deer medicine. 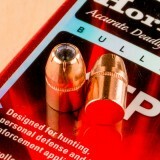 Excellent for use on hogs and deer in carbines with heavy loads of Lil'Gun or H110. 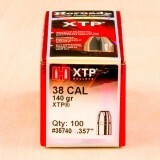 I loaded these in new .357 magnum cases with heavy charges weighed individually. 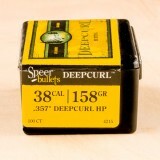 The cartridge was accurate and the recoil noticeable from my 4 inch Python. 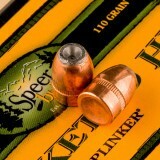 These 180 grain bullets will likely be fine for the smallish central Texas deer. 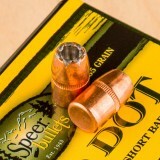 The bullet might be suitable for the myriad wild hogs. 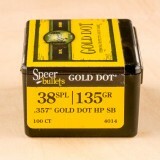 I certainly recommend this bullet.